But are they really smart glasses? Huawei has partnered with Korean glasses brand Gentle Monster to create what it calls its first pair of "smart glasses". 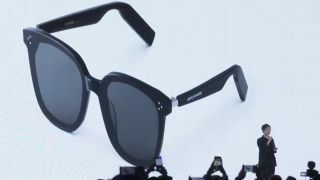 Although Huawei referred to them as smart glasses on stage, it looks like these are instead designer eyewear that will also work as a Bluetooth headset for phone calls. The company sees them as a competitor to Snapchat Spectacles, but it is focusing on style rather than functionality. You'll have the choice of either sunglasses or normal lenses. To answer phone calls and more you'll be able to tap the side of the eyewear as there aren't any buttons. Each pair is also IP67 water and dust resistant. The glasses come with dual microphones so you'll be able to have a phone call hands free. It also features AI noise reduction to ensure clear audio on your call. There are speakers inside the glasses too, which Huawei claims won't have leaky sound as they're positioned to direct the call audio straight into your ears. It's currently unclear if you'll be able to use the glasses for listening to music. Apart from these audio features, it's unclear what else you'll be able to do with the glasses. It doesn't seem like there is a camera within the glasses, like there is on smart glasses such as the Snapchat Spectacles. There's NFC onboard, which is used for wireless charging within a specific Gentle Monster case. We've yet to learn how much these will cost, but Huawei says the glasses are estimated to come at some point in July this year. Huawei hasn't shared where you'll be able to buy them, or the exact range of styles so you can expect to learn more in about that in the coming months.